Further to my last post on social business in the public sector, I recently published an article on the topic on the Scottish Policy Now web site. It discusses some of the frequent patterns for success in social business, and interprets them in a public sector context. 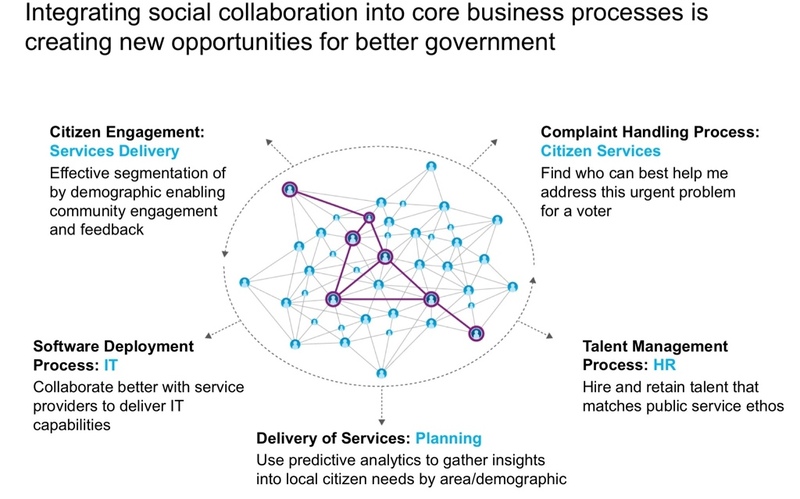 It is becoming clear to me that, while rapid viral adoption of social collaboration can deliver a quick return for organisations, the long term transformational opportunity comes from changing your processes – making them more efficient and more effective by using social, mobile, analytics and cloud solutions. The potential benefits are real. Achieving them requires a cultural change to make organisations engaged, transparent and nimble by empowering staff to improve business outcomes, and process owners to be willing to change the way the organisation works to deliver better outcomes. But it also requires the right collaboration tools that encourage the desired behaviour and integrate with existing systems to allow process improvement without wholesale replacement of systems. However just creating a new social knowledge silo which employees can choose to use or not as they please is not going to create this sort of transformation either – commitment and leadership from the top is critical.